There is only one Ray Gelato! 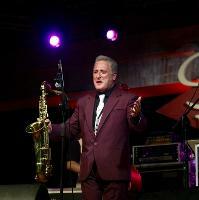 Ray has been taking his special brand of swing, jazz and R&B music all over the world since 1988. This multi-talented singer, saxman, songwriter and band leader has appeared at festivals, clubs and concert stages from Brazil to New York City. Gathering more fans with every passing year, Ray’s audience includes young children and grown up kids alike, for the simple reason that his joyful music lifts everyone who hears it – a unique gift indeed. Ray and his world class band, ‘The Giants’, deliver a high energy show that never fails to get a crowd on its feet. The Giants perform with the highest level of musicianship; the horn section being acclaimed as one of the finest in the business. Ray has been compared to such greats as Cab Calloway and Louis Prima. In fact, he’s been called ‘one of the last great jazz entertainers’! Do you promote/manage Ray Gelato and The Giants? Login to our free Promotion Centre to update these details.